If you had any problem downloading, installing, updating or running the application you can find the solution here. If you hadn’t, you don’t need to read this section. To download the application go to the Downloads section. You’ll find there the latest version. We recommend that you download the full installer if it’s the first time that you install the application in your computer. When the download finishes you must execute the file you just donwloaded: it’s a compressed file that contains the application installer and all the necessary components to run the app. If you see any security warning you can ignore it (we guarantee that our files have no viruses). Once you saved the downloaded file, execute it. You can find it in the usual downloads folder, or you can run it directly if your browser has this option. Run the file that you just downloaded to unpack its contents. You don’t need any unpacking app, the file unpacks itself. Given the Windows version that you are using, you may see a security alett. Don’t worry, you may run this file safely. Windows 8: if you see the security alert you must click the “More info” link and then click the “Run anyway” option to continue. The files are extracted in a temporary folder and they are deleted after installation. First you will be promped to select a language for the installation (may be different as the one for the application). The system language is selected by default, using English as a fallback if the system’s language is unavailable. 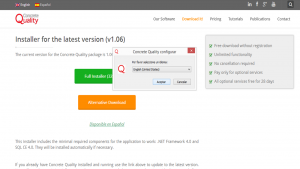 If it’s the first time you install the application in your computer, we recommend that you download the full installer, because you’ll probably need to install some required components to run Concrete Quality. These components are included in the download and they will be installed only if necessary. First of all, the .NET Framework 4.0 component will be installed, if needed. The installation is quite simple: just accept/continue every time a dialog windows asks something (the default options are ok). During the installation of this component it is possible that you need to restart your computer. Don’t worry, when the system restarts the installation will resume automatically. In case it doesn’t, you can run the downloaded file again (or the unpacked “setup.exe”) and continue with the installation of Concrete Quality. In the Downloads section you’ll find a download link for this component, and for version 4.5 too. We recommend version 4.5, but it’s not included in the standard installer because it’s only compatible with newer Windows versions. When the .NET Framework installation finishes, the database engine will be installed: SQL Server Compact 4.0. This installation is also really simple, you can accept all default options. 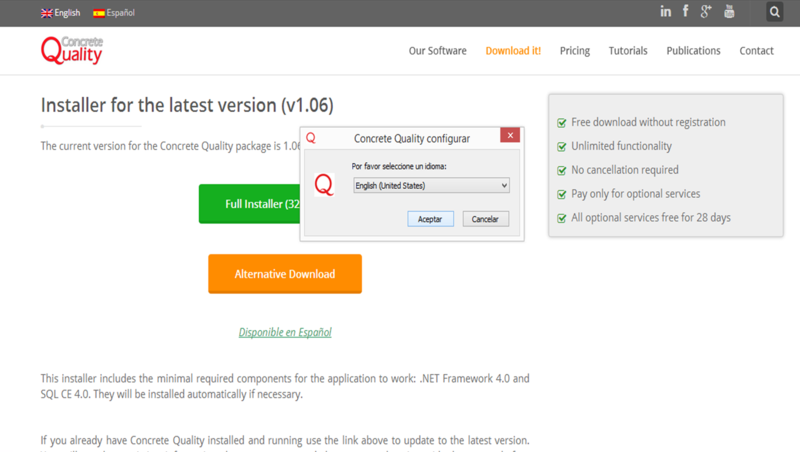 If you already installed all required components or if you’re updating you Concrete Quality version, what you’ll see next is the installer for our application. To proceed with the installation you need to accept the terms and conditions. You can read these terms and the End User License Agreement following the corresponding link (it will not interrupt the installation). After the installation finishes you can use the “Run” button to start right away. IMPORTANT: the application will be installed by default in the “My Documents\Concrete Quality” folder. The reason for this is that the application needs writing privileges for the installation folder. You may install the application in another folder like “Program Files” if you have administrator privileges, but you’ll need to run Concrete Quality as administrator. The best option is to keep the default “My Documents” folder to install the application to. The easiest one is with the link that you’ll find in your desktop after installing. It’s our red Q. 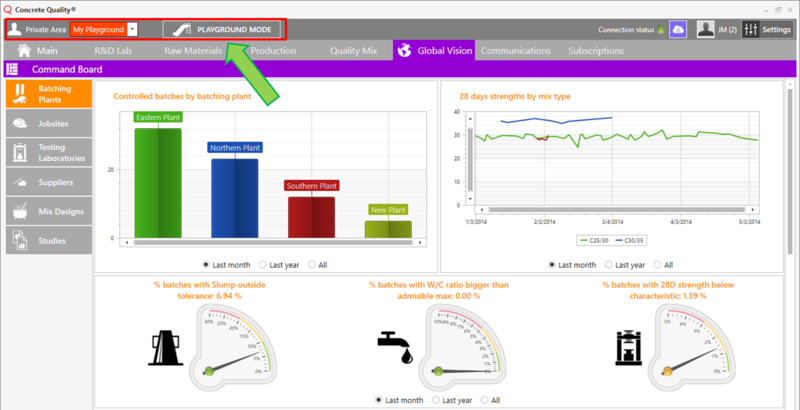 If you are using Windows 8 you’ll find the Concrete Quality icon in your Apps. We’ve tested our application thoroughly, but there’s always something that may not work on some computers. If the application is not working it’s probably due to a problem with one of the required components. These components are not ours and we cannot alter them, but we can give you some tips to solve the most common issues. If you don’t find a solution inside this guide, contact us. It’s normal that this component’s installation takes a long time, depending on the computer it may take up to 15 minutes, so please be patient. If it’s taking longer and the installation does not finish, or if it fails, please go to our Downloads Page and download the most recent version of the .NET Framework supported by your system (we recommend version 4.5 but it’s not compatible with older Windows versions). This installer will repair or update your .NET Framework version if necessary. 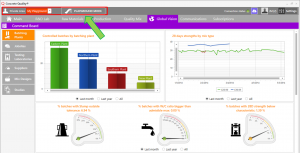 Concrete Quality’s database engine is light and compact: SQL Server Compact Edition (“CE”). Its installation is fast and generally without issues, but nothing is infalible. In our Downloads Page you’ll find a link to download this component (SQL CE 4.0 SP1). Make sure that you download the right version for your system: 32 bits a.k.a. x86 or 64 bits a.k.a. x64. It’s also recommended that you install .NET Framework before attempting to install SQL Server CE. If this is the case, check the installation folder (My Documents\Concrete Quality by default) for a file named “UsersDB.sdf”. If this file does not exist after running the application for the first time, it means that there’s a problem with the database engine. Go to the Downloads Page and download the SQL CE 4.0 SP1 component. Install it and try again. If the problem is not solved, contact us. In order to sign up as a new user you need an active internet connection. In some workplace networks there are certain domains that you cannot access. 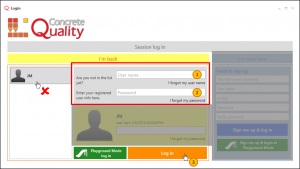 Speak with your network administrator (the IT guy) and ask him to grant you access to the www.concrete-quality.com domain. Tell him that the application will connect by HTTPS (encrypted and secure connection) so he keeps calm. If the problem is not solved, contact us. In some occasions the .NET Framework component may have a problem. Go to the Downloads Page and donwload the lastest .NET Framework version supported by your system (we recommend version 4.5 but it’s only compatible with newer Windows versions). This installer will repair or update your .NET Framework version if needed. In case you can open the application and use it, but it suddenly crashes, contact us and describe what you were doing when the problem appeared. Inside the installation folder (My Documents\Concrete Quality by default) you’ll find a file named “ErrorLog.txt”. Email us a copy of that file, or copy the whole text of the file and paste it inside the contact form, together with the description of the steps that led to the problem. We’ll try to fix it ASAP, and we’ll get back to you when we do. When you run the app, the first thing you’ll see is the Login screen. 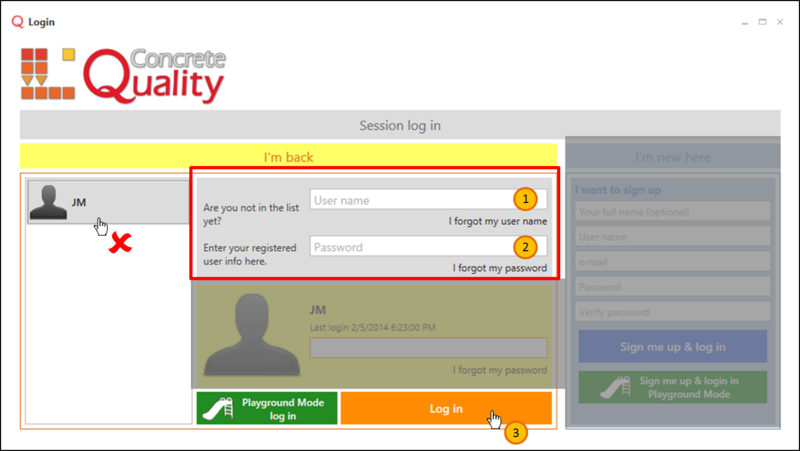 In this screen you can sign up as a new user, or access Concrete Quality using an existing user. If this is your first time using Concrete Quality, you must create a new user. Creating a new user is very easy, surely you’ve done it lots of times. To create a new user go to the panel on the right named “I’m new here” (light blue color). Enter your full name (optional): this helps other users find you and share information with you. Pick a user name: this is the unique name that will identify you in the Concrete Quality network. It cannot be the same as other registered user’s name. Set your email address (optional): not mandatory but highly recommended. It helps other users find you, you can receive notifications and it’s essential if you forget your password. Don’t worry, we don’t send spam. Choose your password: you know how this works. In our opinion the safest passwords are not the most complex, but the longest that you can easily remember. For example, “xK8_v1j5e” is complex and difficult to remember, but “myhorseloveseatingchocolate” is easier to remember and is safer because it’s much longer, even if it contains only regular characters. Confirm your password: just to make sure you’ve got it right the first time. Click the “Sign me up & in” button. This will create a new user and immediately start the application. You need an internet connection to create a new user. 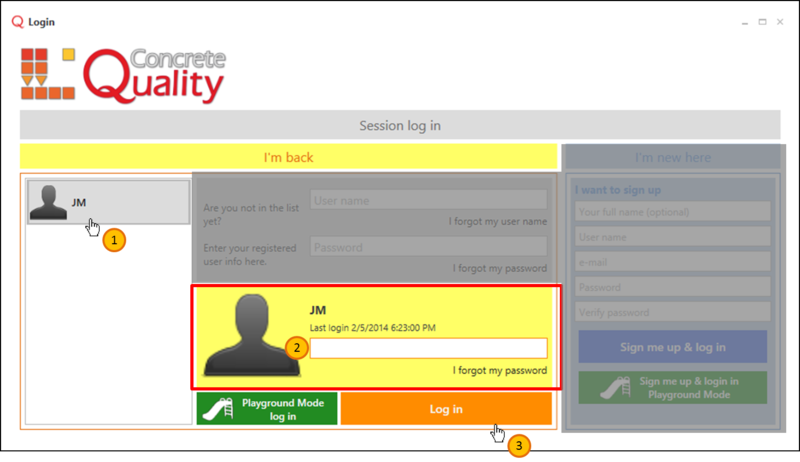 If you already created a user in your computer, in the future you can access quickly with the “I’m back” panel (yellow color). Select your user from the list on the left and enter your password, and that’s it! By default the user that logged last is selected. I cannot be any easier! You can also use the option that you’ll find in the next section, but this one is easier and more convenient. 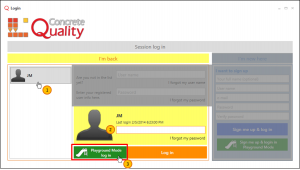 If you already created a Concrete Quality user but it’s the first time you use a computer, you must use the “I’m back” panel and enter your user name and password. This will add your user to the registered users list, so in the future you’ll be able to select it from the list on the left and sign in quickly. 1. What is the Playground Mode? 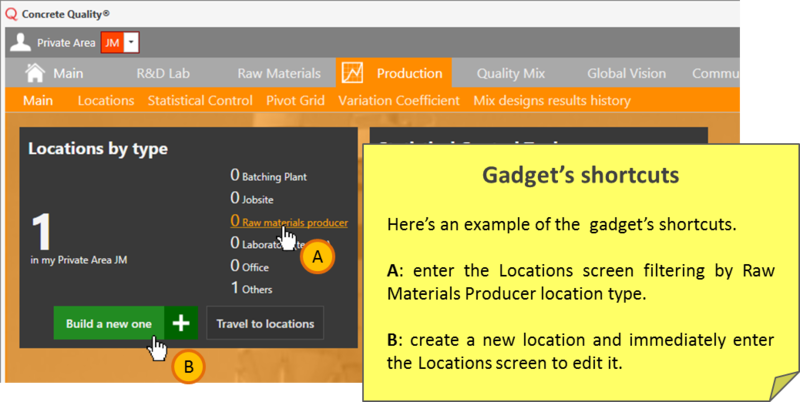 The Playground Mode is the best way to learn about Concrete Quality and to get acquainted with its features. The Playground Mode opens the application with mockup data, which you can modify and manipulate at will and without risk. 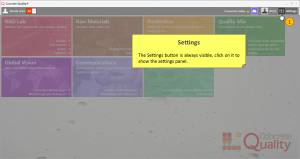 You can create, delete and modify any entity (raw materials, batches, mix designs, etc.) and these changes will have effect only for the duration of the current session. Changes will not be saved to the database, so you always get a fresh start when you enter the Playground mode. 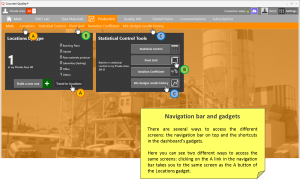 The Playground Mode is specially useful to get acquainted with the analytical tools, such as the Command Board in the Global Vision section, or the Production section’s Pivot Grid. Data analysis features at their best in the Playground mode. Play with Concrete Quality while learning how to make the most out of it! To access the Playground Mode you need to have a registered user, exactly the same as you do in standard mode. 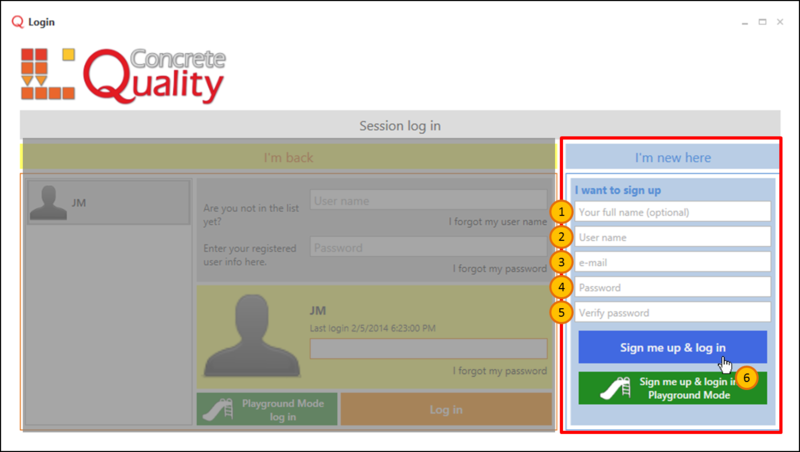 Select your user from the list on the left or enter your username and password, and click the “Playground Mode Log in” button instead of the “Log in” one. Workgroup management: you cannot create or modify workgroup information, enter or invite other users to enter any workgroups while in Playground Mode. Synchronize: Synchronization is disabled in Playground Mode. Saving: all the data that you create and modify in Playground mode will not be saved to the database. 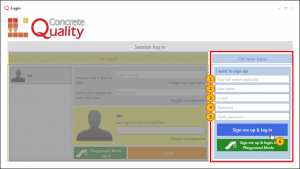 Quality Mix: you will be able to use the Quality Mix service only as long as you have an active subscription for it. You cannot use the Playground Mode to create new mix designs if you are unable to do it in the standard mode. The Subscriptions section is enabled and works normally while in Playground Mode. All the purchases you make are always real. 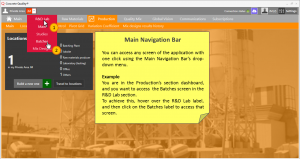 On the top of the application’s window you will find a bar that is always visible and contains useful information and shortcuts for some important functionalities. On the left side there’s the Workgroup selector. You can use it to activate the different workgroups you are member of, including your private area. Each workgroup acts as a separate database, shared with different people. 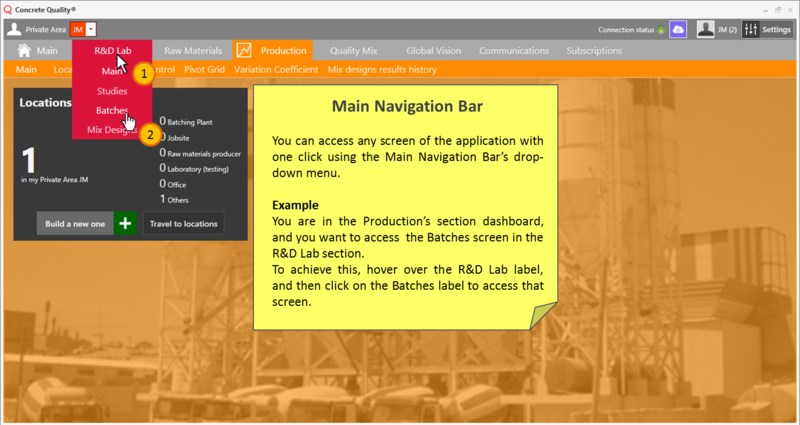 Remember that you will only see and be able to edit the raw materials, batches, etc., of the active workgroup (except the Global Vision section which shows you inter-group information). Private Area (orange): only you can access it and you cannot invite other users to join. This area is created when you sign up. 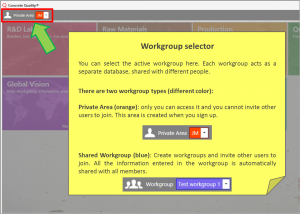 Shared Workgroup (blue): Create workgroups and invite other users to join. All the information entered in the workgroup is automatically shared with all members. You can create as many Workgroups as you like, and invite any numer of users. Connection status gauge: tells you if you are connected to the server. 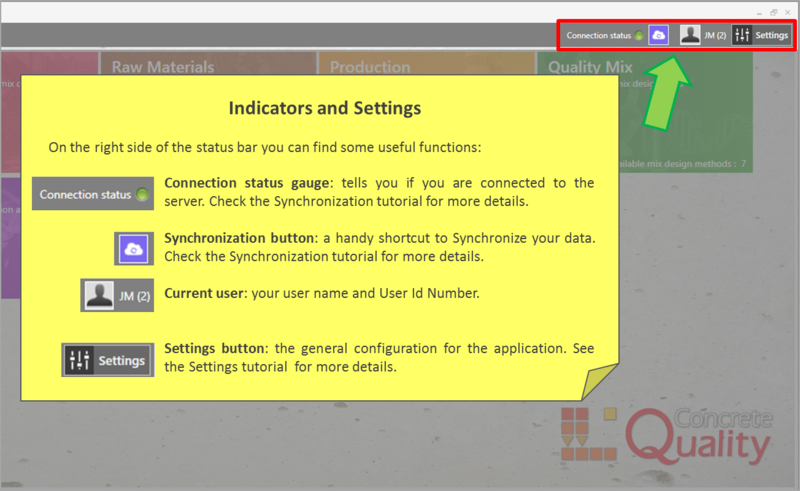 Check the Synchronization tutorial for more details. Synchronization button: a handy shortcut to Synchronize your data. 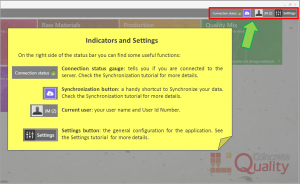 Check the Synchronization tutorial for more details. Current user: your user name and User Id Number. Settings button: the general configuration for the application. See the “Settings” part of this tutorial for more details. The navigation of the Concrete Quality application is intuitive and straightforward. Each section is clearly identified by color, and the different screens have icons representing the information you will find in them. 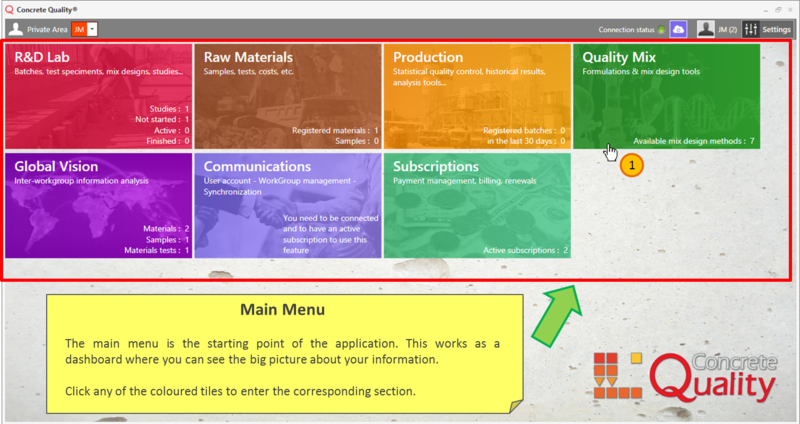 When you open the application you will see the dashboard styled main menu. 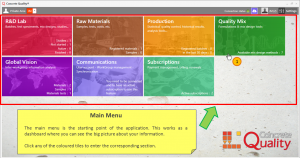 From this menu you can access all the different sections, and have an overview about your information. 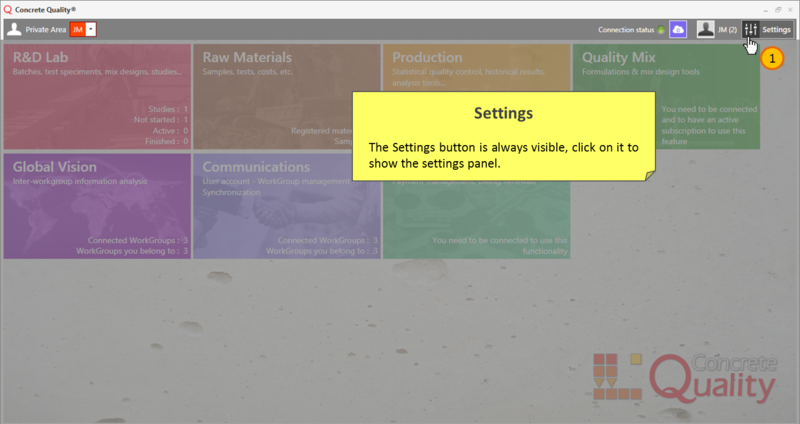 Once you click any of the tiles you will be taken to the corresponding section’s dashboard menu. When you leave the main menu the Main Navigation Bar will appear just below the indicators bar. You can use this to quickly navigate to any screen in just one click. Other sections work just the same; each one has its own gadgets and shortcuts, but the navigation follows always the same principle. The Concrete Quality app has a simple set of settings. You can open the Settings panel clicking the Settings button on the right of the Status Bar. This button is always visible and will display the settings panel anytime. Connect/Disconnect button: use it to connect or disconnect from the Concrete Quality’s server. 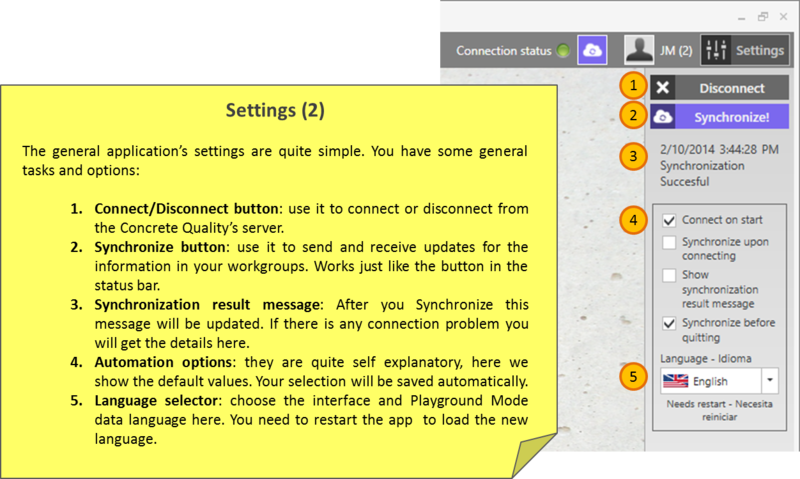 Synchronize button: use it to send and receive updates for the information in your workgroups. Works just like the button in the status bar. Synchronization result message: After you Synchronize this message will be updated. If there is any connection problem you will get the details here. Automation options: they are quite self explanatory, here we show the default values. Your selection will be saved automatically. Language selector: choose the interface and Playground Mode data language here. You need to restart the app to load the new language. You can safely keep the default options, and there’s nothing else to configure. We try to keep it simple so you can focus on your work.